Convert MP3 to AVI, MP4, 3GP and vice versa in batch. Convert DVD to MP3, AVI, MP4, MOV, MP3 and other 1000 formats. MP3 is a commonly used audio format that is compatible with a number of devices and players. Still, there arise situations when you would need to play your audio files using a video player or a device that does not support MP3 format. Here, the need to convert MP3 to AVI arises. To have hassle-free, lossless quality conversion, a good MP3 to AVI video converter is needed. Your search for the best MP3 to AVI video converter ends as Wondershare UniConverter (originally Wondershare Video Converter Ultimate) is there. 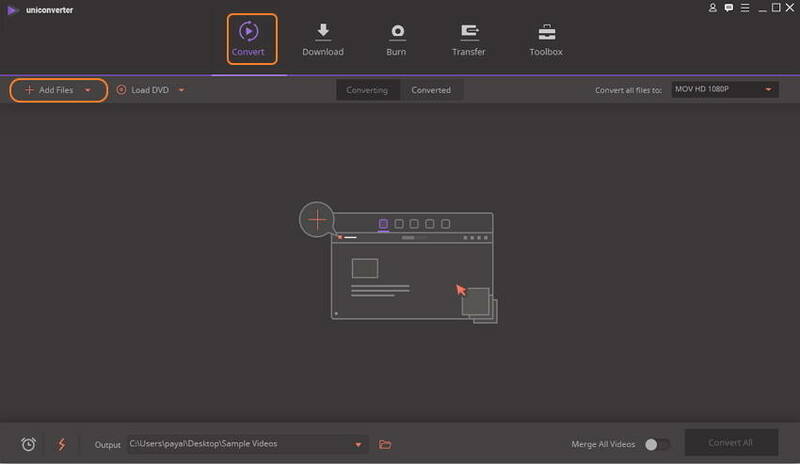 This professional tool facilitates high-quality conversion between 1000 video and audio formats on your Windows and Mac system. In addition to this, it can also download videos from YouTube, Vimeo, and over 10,000 sites. It supports video editing with its complete editor, video transfer, and other functions. Supports adding multiple files at a time for batch MP3 to AVI conversion. Super fast conversion speed (30X faster) owing to APEXTRANS technology of the software. Choose resolution and quality of the output file. Step 1 Open Wondershare MP3 to AVI converter and load MP3 files. On your PC/Mac, launch Wondershare UniConverter (originally Wondershare Video Converter Ultimate). As the main interface appears, choose the Convert tab. Click on +Add Files to import local MP3 files. Alternatively, drag and drop also works here. Step 2 Choose AVI as target format and customize it if you need. As the files are successfully added, they appear on the interface with information. Expand the drop-down menu at the Convert all files to: option on the top-right corner. From the Video list, choose AVI as the target format. Also, select the resolution of the file. You're optional to click Create Custom to customize the AVI format by adjusting the bitrate, resolution, encoder, frame, etc. Step 3 Convert MP3 to AVI. Choose PC location on the Output tab to save the converted file. 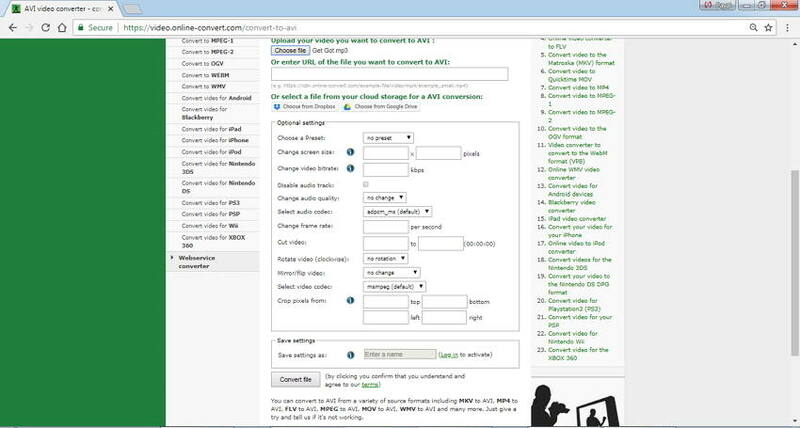 Click the Convert All button to start the conversion process with this MP3 to AVI audio converter. The steps above can also be used to convert AVI to MP3 if needed. 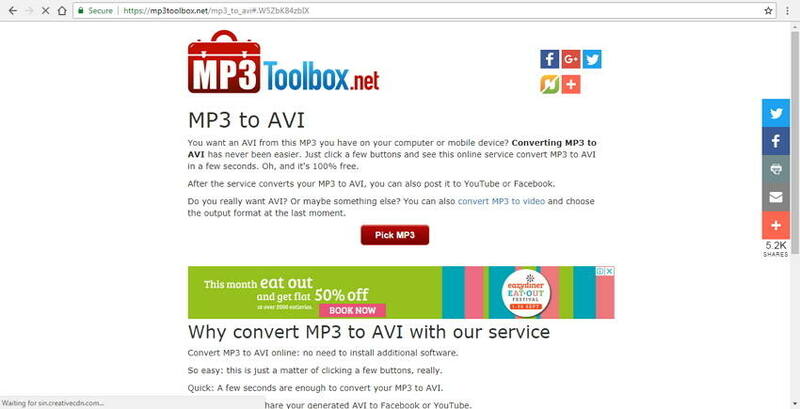 If you want to learn more details about AVI to MP3, go to Top 6 Ways to Convert AVI to MP3 > . For users who have a limited number of MP3 files for conversion and do not require advanced features, MP3 to AVI converter online works as a decent option. Listed below are the MP3 to AVI converter online free tools for your reference. This is a decent MP3 to AVI converter online program that allows quick and quality conversion. The program is compatible with all modern browsers and supports an array of video and audio formats. Popular online video portals like YouTube Vimeo and Dailymotion is also supported. 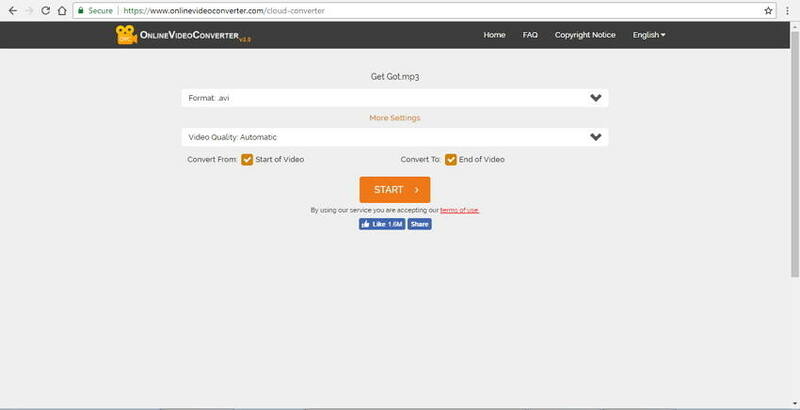 Step 1: From your browser open https://www.onlinevideoconverter.com/cloud-converter. Click the SELECT OR DROP FILE option to add the MP3 file. Step 2: Once the file is uploaded to the program, choose AVI as the desired target format from the list of supported Video formats. Step 3: There is an option to choose the quality of the video in terms of resolution. If needed, you can also cut the video. Step 4: Click Start to proceed with MP3 to AVI conversion process. This MP3 to AVI online program is apt for users looking for a simple process. 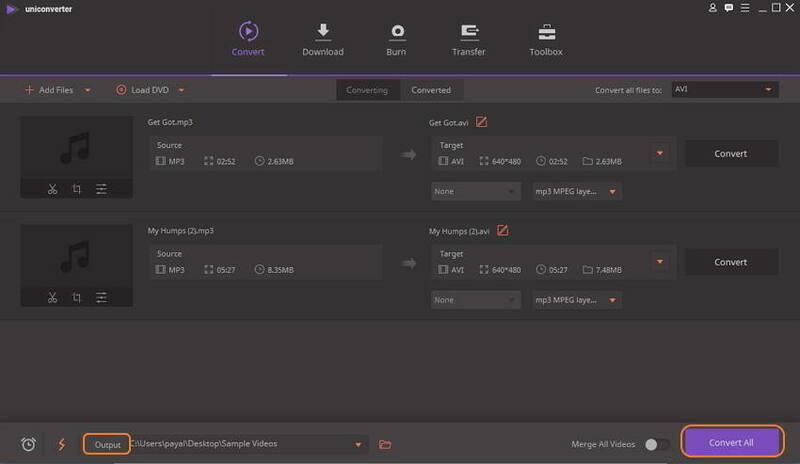 The tool allows converting your MP3 files to AVI and also uploads the same to YouTube or Facebook if needed. Other formats for conversion are also supported. Step 1: Open https://mp3toolbox.net/mp3_to_avi on your PC. Click the Pick MP3 button to add an audio file from your system. Step 2: As the MP3 file is uploaded to the tool, choose the picture from the given option to use as a video background. You can also upload your own picture. Step 3: Click Convert MP3 to AVI button to start the process. 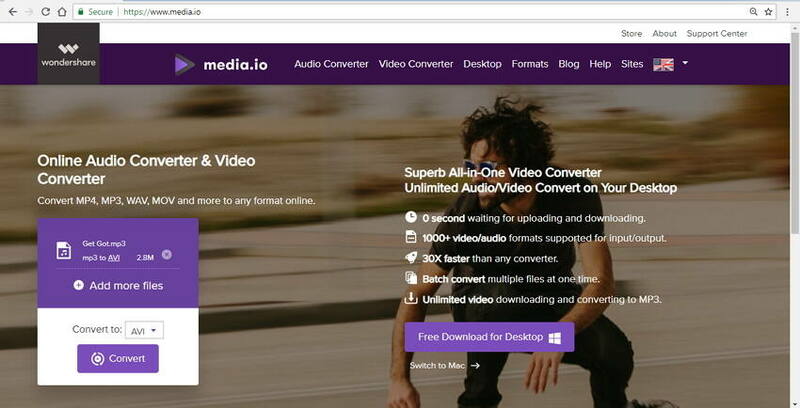 Another decent tool to convert MP3 to AVI online is Online UniConverter (originally Media.io). Using the program, you can add up to 2 files at a time for conversion. The program supports commonly used audio and video format and the converted file can be downloaded from the interface itself. AVI to MP3 conversion if needed is also supported by the program. Step 1: Type https://www.media.io/ to open the program from your browser. Click on the +Add your files button to import MP3 files. Step 2: Choose AVI from the Video list as target format from the Convert to: tab. Step 3: Hit the Convert button to start the process. 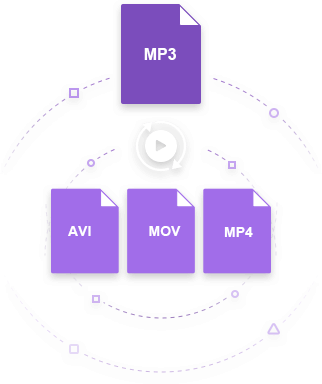 This MP3 to AVI converter free program features simple to use interface with an option to choose video quality as well as size in terms of resolution. 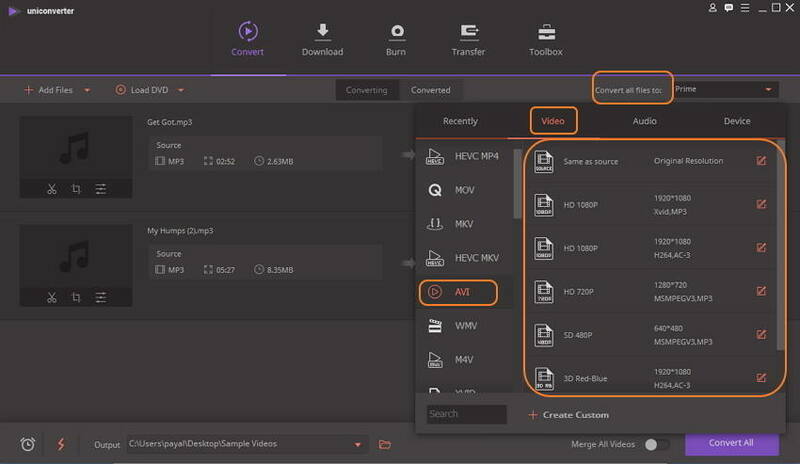 An array of format and file types including video, audio, archive, and others are supported by the tool for conversion. 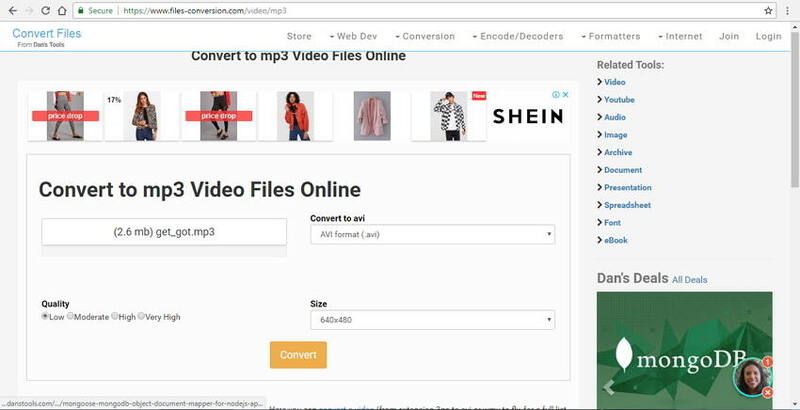 Step 1: Launch https://www.files-conversion.com/video/MP3 from your browser. Click Select a file button to import MP3 from the computer. Step 3: Click Convert button to start uploading and converting MP3 to AVI. This online conversion tool facilitates converting your MP3 files to AVI format with an array of additional features. You can edit your video with features like cut, crop, rotate, and flip. File parameters like resolution, frame rate, size, and others can be edited as desired. Step 2: Under the Optional Settings, choose the file parameters like bit rate, size, frame rate, and others. You can also crop the, cut, mirror, flip and rotate. Step 3: For future files with similar conversion, you can save settings as well. Click Convert file to begin the process. The table below compares the professional UniConverter (originally Wondershare Video Converter Ultimate) and the listed online MP3 to AVI converters, so that you can pick up the most suitable one depending on your requirements. Allows choosing file bit rate, code, frame rate, and size.